You may already be aware of your legal obligations when it comes to fire safety, or this may be a completely new area of responsibility for you. This guide will explore the role that evacuation chairs play in fire safety and why they may be a necessary investment for your organisation. Certain steps must be taken to ensure that the risk from fire in a premises is reduced, and that everyone in a building, on the premises or nearby can escape if there is a fire. Evacuation chairs play a vital role in fire safety planning and evacuation from a building. In this guide we will be looking specifically at your duties in relation to fire safety and escape in an emergency covered by the Regulatory Reform (Fire Safety) Order 2005 which is a key piece of legislation in relation to fire safety in the UK. You can view the legislation in full here Regulatory Reform (Fire Safety) Order 2005 (opens in a new window). Hopefully this guide will provide you with enough information to decide if your organisation requires an evacuation chair according to the Regulatory Reform (Fire Safety) Order 2005. Taking steps to enable those people to escape safely which may include the use of evacuation chairs. You may have heard of the term “Risk Assessment”. There is a duty under the Regulatory Reform Order to conduct a risk assessment of your premises. A Risk Assessment is in effect the formal identification of elements in your business that may cause harm to your employees or people on your premises. This will then enable you to take action or precautions to prevent that harm. A major focus in any Risk Assessment will be fire safety. The assessment of whether evacuation chairs may be required in your organisation will take place at stage/step 3, when evaluating the risks and deciding on precautions. Our aim in this guide is to identify what you should consider when deciding whether an evacuation chair is necessary. Which types of building or premises are covered by this Order. Who is responsible for fire safety. What precautions you must take to ensure fire safety. Considering Employees and Visitors - disabled, injured or pregnant workers and visitors. Do I need an evacuation chair? Do I need evacuation chair training? Please note, to understand all of your duties with reference to fire safety, you should read the full Regulatory Reform (Fire Safety) Order 2005 (referred to here as the Order). This guide is a general guide related to key points that relate to evacuation chairs. Your duties may vary according to circumstances, and this guide should not be read as identifying your entire obligations in relation to the Order. 1. Which Type Of Buildings, Premises or Land Are Covered By The Order? There are exceptions to this definition (outlined in Article 6), however this meaning covers a huge number of premises. It is therefore highly likely that your premises will be affected by the Regulatory Reform (Fire Safety) Order 2005. Although the Order does not cover single dwelling domestic premises such as private houses, the Order does apply to shared domestic premises where there are communal areas such as landing areas or hallways. This will be applicable to blocks of flats or buildings converted into separate flats. 2. Who Is Responsible For Fire Safety? The person responsible for implementing these measures is called “the responsible person”. If you are reading this guide, it is more than likely that you yourself are the responsible person. If you have not yet identified the responsible person in your organisation, the general rule is that he or she is the employer in the workplace. If your premises are not a workplace, the person responsible is the person in control of the premises or the owner of the premises. (Article 3 of the Order). training on what to do in the event of a fire and what measures should be mitigate the effects of fire. Crucially, these duties apply to both employees, and anyone who is or may be lawfully on the premises (Article 8). This duty therefore also extends to visitors to the workplace or premises. 4. Considering Employees and Visitors – Disabled, Injured and Pregnant Workers and Visitors? The Regulatory Reform (Fire Safety) Order 2005 states that you must consider the safe escape from the premises of both your employees and anyone else who may be on the premises legally (Article 8) such as visitors or customers. Therefore you must identify the types of visitors or customers you may have on the premises and the challenges that may present themselves in an emergency evacuation situation. It is especially important to consider how you would evacuate a disabled, injured or pregnant person from the building in an emergency, and in particular if stairs will be used in the escape. It is also important to bear in mind that lifts are likely to be out of action or prohibited from use in the case of a fire. Staircases then become the primary means of emergency evacuation. In multi storey buildings, it is highly likely that disabled, injured or pregnant workers/visitors will have used the lift to ascend the building, but will have to use the stairs to escape in an emergency. It must be stressed that this duty to consider the safety of people on your premises is not limited to employees. It extends to anyone who may come on to the premises. If your building is open to the general public, you are likely to have a wide range of visitors or customers. It is worth noting that in the UK today, 7.6 million people between the age of 16 and 64 are disabled*, which equates to approximately 1 in 8 people. There is a real possibility that you will have a high proportion of disabled visitors. You must assess how these people would be evacuated in an emergency. Where stairs are the method of escape, evacuation chairs provide a safe and swift method of escape. By providing a safe evacuation method for potential visitors through the deployment of evacuation chairs, you will also be securing the safe evacuation of your premises where future challenges may present themselves. For instance, a member of staff may suffer an injury and be temporarily on crutches, you may employ a new member of staff who is a wheelchair user, or a female member of your team may become pregnant. 5. Do I Need An Evacuation Chair? When deciding whether you require an evacuation chair, you should first consider whether your premises are covered by the Order. Secondly, when considering which fire precautions to take, ensure that you have taken the necessary precautions in relation to the means of escape from the premises for employees and visitors (Article 4 (1)(b). You should consider your current employees, visitors, customers or anyone else who is likely to be on your premises, and how you would evacuate these people in an emergency. Key points to consider when assessing whether you need evacuation chairs are whether your escape routes include the use of stairs. If so, you should then consider whether employees and visitors to your premises who will use the stairs to escape will include, are likely to include or may include disabled or injured people, pregnant women, or anyone else that may find negotiating the stairs difficult. Under the Order, there is a duty to secure that at all material times, the means of escape can be safely and effectively used (Article 4(1)(c)). If anyone on the premises is unable to use the stairs or escape route without an evacuation chair, you should look to ensure that an evacuation chair is available so that the stairs can be used to escape safely. If you are considering avoiding the purchase of evacuation chairs because you plan to prevent people with a disability from using areas of the building with stairs, or saying that higher floors are out of bounds for safety reasons, you may be exposing yourself to a discrimination claim under the Disability Discrimination Act 1995 and/or the Equality Act 2010. If you were to limit access or adjust working practices in this way, you could be discriminating either directly or indirectly, or your actions in not purchasing and making available evacuation chairs could be considered a failure to make reasonable adjustments for a disabled person. 6. Do I Require Evacuation Chair Training? 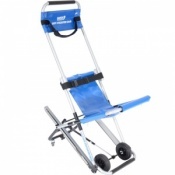 We offer evacuation chair training on all models of evacuation chairs and sledges. There is a duty under the Order to ensure that your staff are provided with adequate safety training (Article 21). The training must include suitable and sufficient training on action to be taken by the employee in order to safeguard himself and any relevant people on the premises. This would include the safe use of evacuation chairs. If you feel that you would benefit from evacuation chair training, we are able to offer employees in your organisation key operator training. This enables those members who have received the training to train others in the organisation. Key operator training is therefore a train the trainer course, and is an incredibly cost effective way of training up large number of your team. Take steps to enable those people to escape safely which may include the use of evacuation chairs. Evacuation chairs play a vital role in fire safety and the ability of you and your team to evacuate from a building safely. Put simply, evacuation chairs save lives and we will help you in any way we can to decide upon the correct evacuation chair for your circumstances. Our Customer Care Team are ready to assist you on 020 7720 2266 if you require any further information. We look forward to your call. Please note that this guide is for reference purposes only, and is not designed to substitute or fully explain your entire legal obligations in relation to fire safety, fire planning and evacuation plans and procedures. Please consult a legal professional, the legislation, your local fire brigade, fire marshal or other responsible person to ensure that you are meeting all of your responsibilities under all relevant UK legislation.